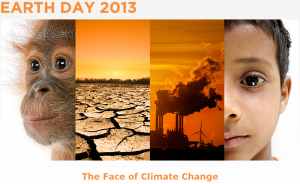 It’s that time of year again…Earth Day 2013 is here! This year’s theme is “The Face of Climate Change”, which is incorporating social media in an effort to raise awareness about the massive challenges that changes in climate present and the efforts underway worldwide around the world. This day of specific acknowledgment is so important, especially as the number of extreme weather events seems to grow each year, putting a greater strain on our nation’s water infrastructure. Earth Day is a great time to remind us all that our most precious resource, water, is not to be wasted or undervalued. It’s a day to remind us to do our part to ensure that we protect our environment to the best of our abilities, and its vital resources. Be conscious of your daily water use and take the necessary steps inside and outside your home to be water smart. Simple actions like turning off the tap while brushing your teeth or washing dishes, only running full loads in the clothes and dish washer, and using a broom instead of a hose to clean up outside walkways, can make a big difference. Also consider replacing old fixtures with water efficient ones, such as those with the EPA WaterSense label. Regularly check for leaking toilets, pipes and faucets — indoors and outdoors — and repair them promptly. Drink water wisely — keep a reusable bottle of tap water handy. Avoid purchasing bottled water; in addition to being more expensive and less stringently regulated as tap, it is less environmentally friendly. As many as 85 percent of plastic water bottles — an average of 38 million bottles a year — are sent to landfills rather than recycled, despite being made of recyclable materials, according to the Container Recycling Institute. Take care in the use and disposal of garden, lawn, garage or other home products and ensure that they do not find their way into groundwater. Dispose of unused or expired medicines properly. Don’t pour them directly into home drains, the sewer, street drains or the lawn, and don’t flush them down the toilet. The point in the end is that we are all the face of climate change, and we all have the ability to make a positive impact, so I ask you all to participate in this year’s campaign! Through the Earth Day website, or your Instagram and Twitter accounts, take pictures of your Earth Day-related activities to share with the world. This campaign is a creative way to get people of all ages involved in Earth Day and explain the importance of preserving the environment and its resources. The more people who participate, the more of an impact it will have! To learn more about Earth Day 2013 and The Face of Climate change go to www.earthday.org/2013. To see “The Face of Climate Change” photo display, go to www.earthday.org/faces.